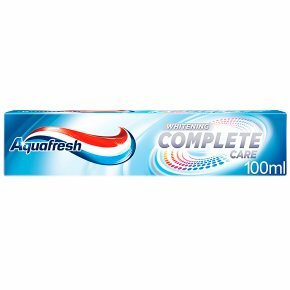 24h Sugar Acid Protection* Aquafresh Complete Care toothpaste with a gentle whitening action - complete protection for your whole family in a fresh minty flavour they'll enjoy. With 24 hours Sugar Acid Protection* provided by active fluoride - creating a shield that protects the tooth surface against sugar acid attack throughout the day. *Brush twice daily with a fluoride toothpaste and follow a healthy diet as protection may decrease between brushing. 8 key benefits for strong teeth and healthy mouth Cavity Prevention Healthy Gums** Fresh Breath Fights Plaque** Great Taste Removes Surface Stains Enamel Strengthening Antibacterial Action **With regular brushing.